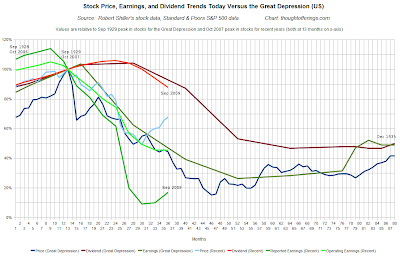 With S&P 500 earnings reporting mostly (98%) complete for Q3 2009, it's time for an update to the charts from Dividends, Earnings, and Stock Price Trends have Tracked the Great Depression. 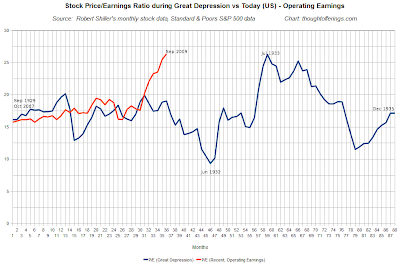 Earnings have dropped more rapidly than during the Great Depression (dramatically so if you count reported rather than operating earnings), but they appear to have begun a recovery much sooner than occurred back then. Trailing 12-month dividends are still falling slightly faster than during the Great Depression, which is particularly remarkable given how much more severe deflation was then compared to now. These trends underscore that contrary to some claims, this is no crisis of confidence! Since dividend changes tend to lag earnings changes, rising earnings could mean dividends will level out and start increasing soon (and in fact the quarterly fall in dividends from Q2 to Q3 was small). However, if earnings are being over-reported thanks to factors such as relaxed accounting rules or optimistic loan loss assumptions, dividends should ultimately reveal the truth about underlying cash flows. And while we should all hope that this recovery can be sustained, there is a significant probability (details of which I hope to discuss in a separate post) that this is a temporary upturn in a longer term depression. A renewed fall in GDP, persistent unemployment, and intensifying deflationary pressures would not be good news for any fledgling recovery in earnings and dividends. 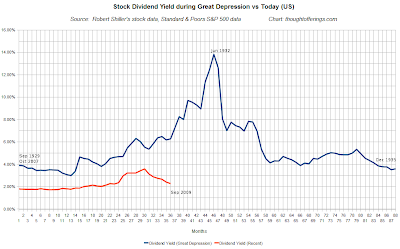 Here is a chart comparing the dividend yield today with the Great Depression trend. Yields are much lower today and are trending down again despite the significant upward yield trend back then. So is this a genuine early economic recovery, or a sign that the modern stock market tends to be a capital-gain seeking momentum machine with little regard for underlying fundamentals? Yes, interest rates are low, but they were back then too, and David Rosenberg suggests most current corporate bond yields are a lot more attractive than yields of the same companies' stocks. 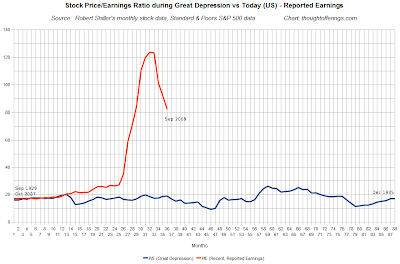 The next chart compares price/earnings ratios earnings during the Great Depression with today using reported earnings. There is no comparison. The P/E ratio based on operating earnings has soared above 25 just as it did at a later stage during the Great Depression. I just wish I had more confidence that this was the start of an earlier sustainable recovery rather than a sign of the irrationality of markets and reckless myopia. Note: All of these charts use Robert Shiller's monthly stock data (with a single representative stock price for each month), not daily prices.